U.S. wildfires burned more than 10.1 million acres in 2015 — a new record. Wildfire suppression costs the United States, on average, $2.9 billion a year. Researchers say that the United States must make preparing for and adapting to wildfire a top national priority, recognizing that widfire is a “wicked problem” — one so complex that a one-size-fits-all solution does not exist. The 1974 American disaster film “Towering Inferno” depicted well the earnest struggles of firefighters engaged in ending a fire at a 138-story skyscraper. To this day, fires at high-rise buildings are considered one of the most dangerous disasters. Researchers developed a wall-climbing scout drone to fight fires in high-rises, finding the source of the fires and locating people trapped inside. Fires are frequently caused by smoldering cables. New sensors now help detect such smoldering fires at an early stage by analyzing the plastic vapors released by overheated insulating cables. Scientists have developed these hybrid sensors that combine measurement processes with data evaluation. These detect the gases released from the plastic coating due to heating and reliably identify and analyze the gas mixture and its concentration. The ten years since 2002 saw an annual average of nearly 71,000 wildland urban interface (WUI) fires recorded and 1.9 million hectares (4.7 million acres) burned. Today, more than 32 percent of U.S. housing units and one-tenth of all land with housing are situated in the nation’s 89 million hectares (220 million acres) of WUI, putting approximately 72,000 communities and more than 120 million people at risk. A new study demonstrates that prompt and effective action can significantly change the outcome of fires that occur in WUI — areas where residential communities and undeveloped wildlands meet. Every year, devastating forest fires take place in Europe and around the world, destroying thousands of hectares of forests and severely impacting citizens and the environment. EU-funded research teams, mindful of the current and future risks, have been focusing their efforts on developing systems and tools that can help avert disaster. Firefighting is not what it used to be. Whether it is a complex blaze raging in an urban high-rise or a seemingly straightforward single-level home fire, modern building construction and furnishings have made fighting fires more difficult: Flames burn hotter, produce more smoke, and spread more quickly. But fire research has advanced, too, and researchers are working with five major urban fire departments to build new knowledge on modern residential firefighting into game-based online simulations with an engaging, dynamic format. Flame retardants are added to foams found in mattresses, sofas, car upholstery, and many other consumer products. Once incorporated into foam, these chemicals can migrate out of the products over time, releasing toxic substances into the air and environment. Inspired by a naturally occurring material found in marine mussels, researchers have created a new flame retardant to replace commercial additives that are often toxic and can accumulate over time in the environment and living animals, including humans. DHS wants better technology for first responders — police, firefighters, and EMTs — but rather than pushing for innovation from within the massive corporations that already provide technology to government agencies, the DHS has come to Silicon Valley to tap the entrepreneurial ecosystem of northern California. Giant technology firms have resources of large scale manufacturing and distribution, but there is one crucial difference. Technology startups are much more nimble, and can shift their development much faster than the huge corporations can. A new device, dubbed Thermal on Demand (TOD), allows firefighters to see everything in a heavily smoke-filled room, where the unassisted eye sees nothing but a pitch-black environment. TOD allows responders to see doors, furniture, light switches, debris on the floor, and victims lying on the floor. Looking through a periscopic lens, in front of a thermal camera, the wearer sees a detailed image of everything in the immediate vicinity. Wildfires have been ravaging large parcels of land in the West and there seems to be no end in sight for the weary Westerners. There are hundreds of individual fires blazing across at least 1.1 million acres in the West. 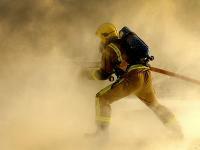 Both the military and foreign firefighting crews have been called in to help the beleaguered firefighters in the West. Washington State’s firefighters are stretched to the limit, and on Friday the state’s Department of Natural Resources (DNR) opened centers in Omak and Colville to coordinate offers of help from trained, qualified volunteer firefighters and from people who have and can operate machinery like backhoes and bulldozers to dig fire lines. The twenty-one wild fires which have erupted in different parts of the state have already cost lives, dozens of homes, and millions of dollars in damages. To fight fires, firefighters need water – and although state water and fire officials say that, so far, there is no danger of running out of water, they are conscious of the state’s water predicament and they are trying to be more careful in the use of water. The persistent drought has forced crews to get creative, using more dirt and retardant on wildfires. Firefighting response to several blazes has been slowed down by the drought, because firefighting helicopters found it impossible to siphon water from lakes and ponds where water levels were lower than in previous years. In the past, property owners whose properties were threatened by fire, would allow firefighting crews to tap water on their property, and would then be compensated by cash reimbursements from the state. Now, many property owners demand instead that the state replenish the water used by firefighters to protect the owners’ property. A spokesman for the U.S. Forest Service said last Thursday that private drone flights in restricted airspace around forest fires have impeded the efforts of firefighting crews to deal with a blaze in the San Bernardino Mountains. The incident has increased the fears of fire and aviation officials that the growing national use of hobby drones could seriously disrupt traditional air traffic and put lives at risk.